Our once simple door is going high tech. It is not enough to have the best wireless doorbells. Now, we are going keyless as well. Why is a keyless lock useful? There are plenty of reasons. For example, you might have kids that you don’t trust with keys. Alternatively, you don’t want to carry a key whenever you are going to the garage and yet not have the door being unlocked. Whatever the reasons, here are the some of the best keyless deadbolt for the money in 2016. Let me know if you have better recommendations. 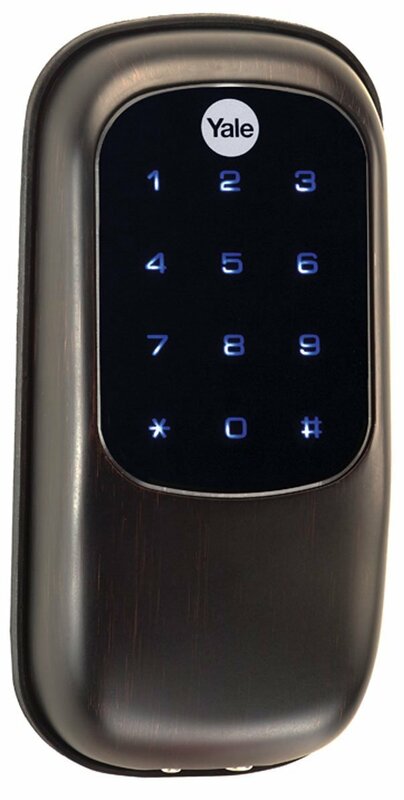 The Schlage camelot keypad is one of the most popular and well rated keyless entry lock on Amazon. It has its pros and cons and this is what the review will highlight. The best thing about the lock is that it is still manual. You have to key in the code combination and then turn the pad to unlock it. Why I love this is simple. The less mechanized parts, the less potential trouble it will be created in the future when the parts break down. When it comes to locking it from the outside, it is even simpler. Just press the button with the Schlage logo and turn the lock. There is no need to key in the combination. This is such a clever design that increases the convenience of using the product. With this in place, I never have to worry about not bringing keys or being locked out, which can be a problem for some. However, do note that you need to aware of the battery life. Usually, the deadbolt will give you advance warning when the battery is about to run out. If you don’t replace it after repeat warning, you will be locked out! Consider this is a warning for those who like to procrastinate about changing batteries. Also, this is a weather proof keyless deadbolt. If you get the installation correct and ensure that the exterior mounting plate covers the internal well, the rain will not be able to get in. In fact, heat, snow and other weather conditions all will not affect how this deadbolt functions. Installing the device is easy enough. I have written a short guide below to help you with it. The good thing about it is that you can easily change the locking code and you even can have more than one code. The latter is useful when your family members want a code different from yours that they can memorized better. To be honest, a lot of the negative reviews I read seem to come from defective production, which can easily be remedied with a replacement, although the Schlage customer service is not the best in the world. I don’t think this issue is big enough to overlook some of the good things this product has looking for it. First, make sure your door hole dimensions are correct. Schlage keyless lock requires a 2 1/8 mounting hole. If your current key hole is smaller, you need to wide it out before doing the installation. Second, follow the instructions and do the necessary screwing and unscrewing. 3 simple steps to done everything up and running. Another brand you can consider is Kwikset lock which has also garnered a lot of positive reviews on Amazon. 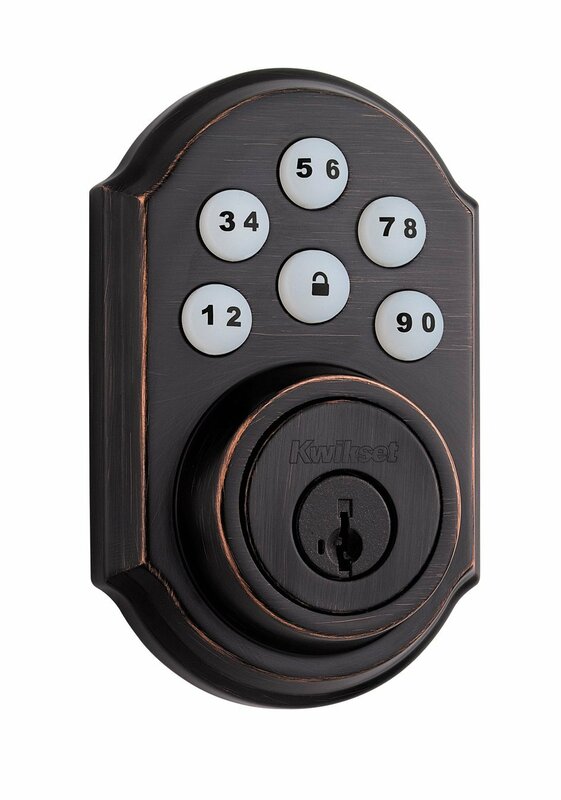 Kwikset has some features that are missing from the Schlage so a direct comparison will be useful. 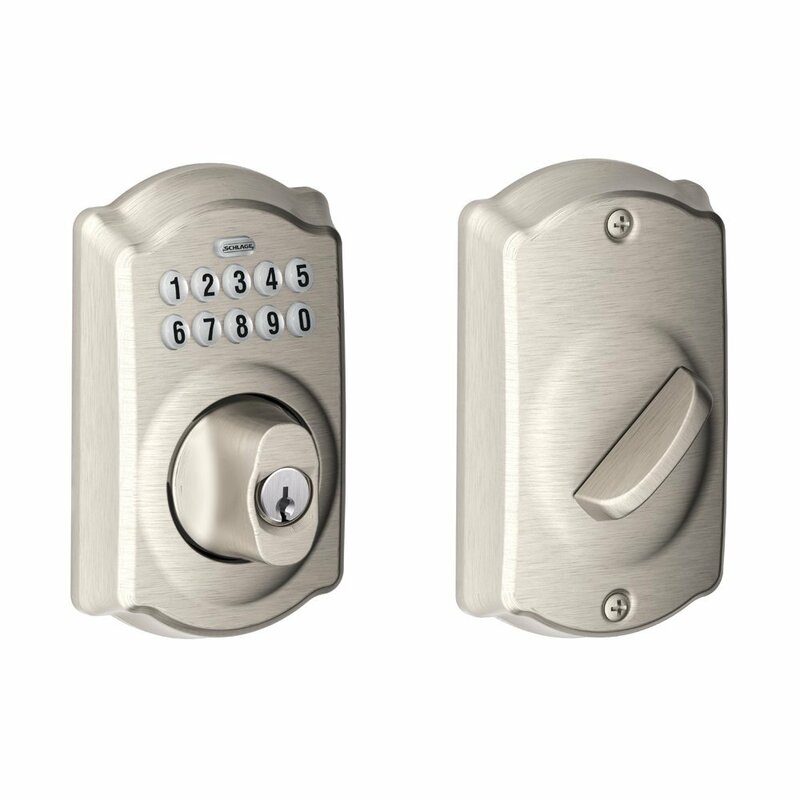 Unlocking from inside: With older Schlage models, you can unlock the door from the inside even when it is locked. For Kwikset, once it is locked, you need to unlock it to get out. Whether that is a good safety feature or a troublesome function depends on personal preference. Built quality: Schlage has a higher built quality as Kwikset is starting a lot of plastic parts in its deadlock system. Also Schlage has a ANSI grade one bolt which makes it more resistant to external forces. Installation: Kiwkset has more parts so assemblying it will take longer. Not a big deal but something to note. After knowing the difference, you can have a better sense of which one to choose. Frankly speaking, both keyless deadbolts are the top line in this category so you can’t go too wrong with either of them. What I said about Schlage can be easily said for Kwikset except for the differences highlighted above. The final brand recommendation comes from Yale. Its recent model, theYRD240-ZW-0BP is a quite a hit with consumers although the prices are relative higher. It has the auto locking mechanism similar to Kiwkset but has one glaring weakness: when the door is wide open, the autolock will still kick in thus ‘locking’ the door when it is in fact wide open. Worse still, this will show up as a locked door when you check its status via your mobile. The best is to remove the auto lock function so that this doesn’t happen. This Yales has wireless connectivity capability and uses the Z-Wave as its protocol. This has both pros and cons. The advantage is that it can communicate with other devices that uses z wave as well. The disadvantage is that this protocol can be a bit unstable compared to simply connecting the deadbolt to the wifi system in your home. Unlike the other two, Yale has a touch screen. Whether this is a better design depends on your preference. I personally prefer tactile feedback so I prefer the other brands. By the way, if you really love touchscreen, Schlage has a new touchscreen model called the Schlage Connect Camelot Touchscreen that you can check it out. Keyless entry locks seem to be becoming more common due to its convenience. If you want to try it out, any one of the brands mentioned above offer top rated keyless deadbolt locks that you can consider.